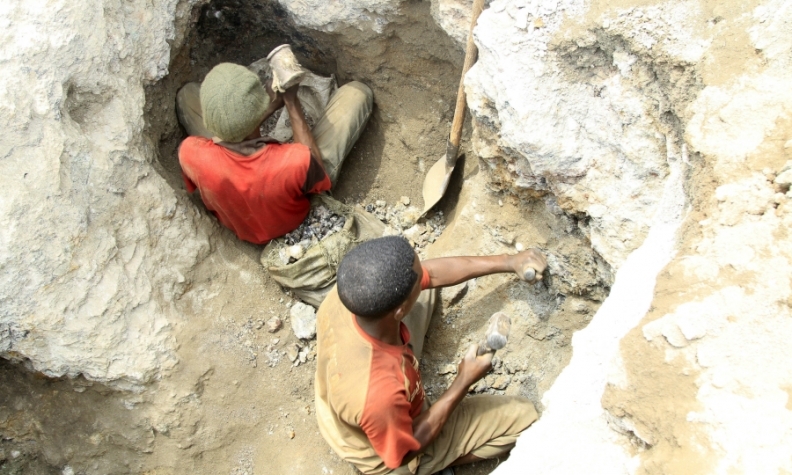 Miners dig for cobalt in the south of the Democratic Republic of the Congo. Investors are running up the prices for cobalt, an important element that automakers and suppliers use in lithium ion batteries as they prepare for an increase in electric vehicle production. The batteries are used in both electric and hybrid vehicles. Investors plan to amass and sit on cobalt until its price rises with demand, Reuters reported last month. The Reuters report said Shanghai Chaos Investments and Switzerland-based Pala Investments as two of the companies that invested in cobalt last year, although the amount they’ve stockpiled is unknown. On Dec. 1, cobalt was just around $30,000 per metric tonne, according to the London Metal Exchange. One metric tonne equals 2,204 pounds. As of Monday, one metric tonne of cobalt was $49,000. That’s an increase of 63 percent in three months. However, EVs have not been hot sellers amid continued low prices for gasoline. In 2016, U.S. sales for the alternative power car segment dropped 19 percent from a year earlier, according to the Automotive News Data Center. Battery-electric vehicles decreased 12 percent for the year, and hybrid sales fell 21 percent. While LMC Automotive expects battery-electric vehicle sales to soar 523 percent from 2016 to 2023, the increase translates to 416,571 vehicles and a 2.35 percent share of U.S. vehicle sales. Jeff Schuster, senior vice president of forecasting with LMC Automotive, said he does expect the push for autonomous vehicles to have an effect on EVs. He says it makes sense for driverless vehicles to be electric to manage computing power and refuel with little or no human intervention. “That all means more demand for cobalt and the need to find additional sources of this rare chemical element,” Schuster wrote Automotive News, a sister publication of Automotive News Europe in an email. 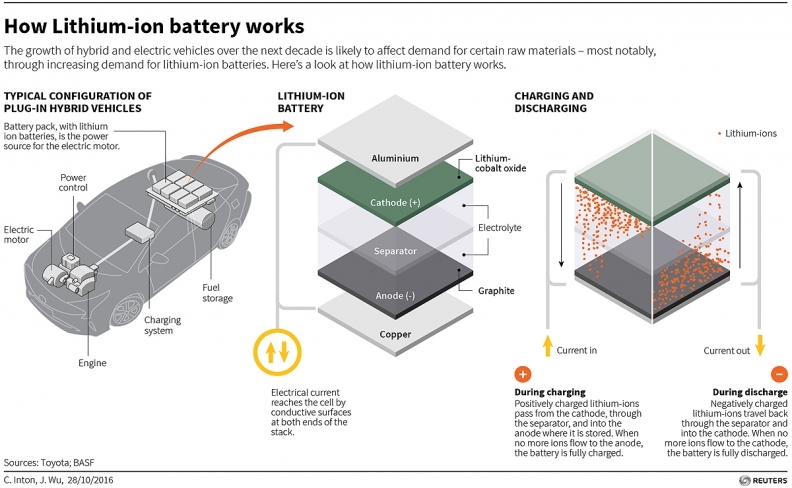 Lithium ion batteries will be the main driver behind increased cobalt demand, according to eCobalt, a producer of battery-grade cobalt salts. 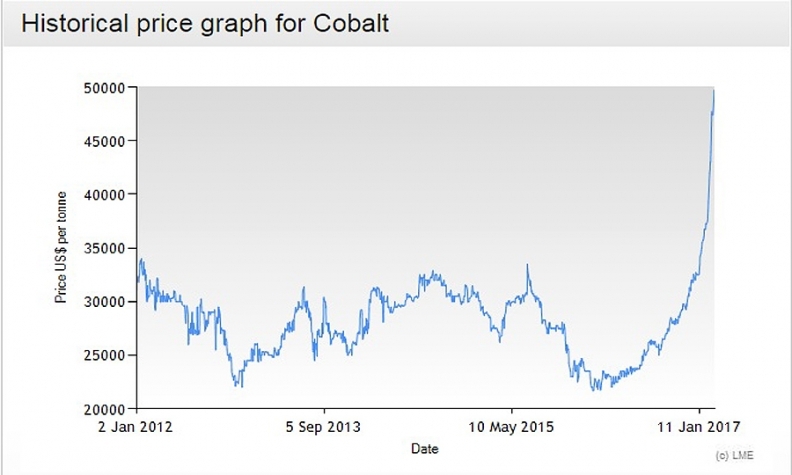 ECobalt expects a 68 percent increase in cobalt consumption between 2015 and 2025. Schuster said additional sources of cobalt also may be valuable down the line because most of it is mined in the Democratic Republic of Congo, which has not been politically stable. Neither Tesla nor General Motors, which both have made significant investments in EV production, responded to requests for comment. Panasonic, which supplies Tesla with batteries for the Model S, Model X and Model 3, also could not be reached for comment.